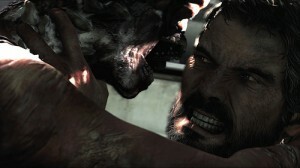 The Last of Us has gained a large amount of hype for the lack of information about it. The world first found out about it leading up to the Spike TV Video Game Awards (this show being a complete joke, but that’s another story). 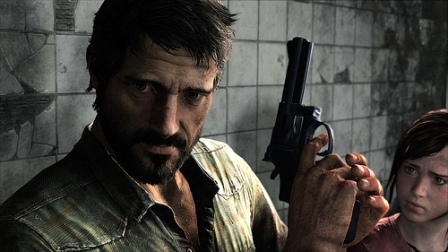 Some of the first information we had about The Last of Us, was just a screenshot of some very real looking foliage. This was followed up by a newspaper stand that was cracked. In it, the issue read that the President was addressing the nation as millions are feared dead or infected. There are also mentions of failed quarantines in Texas and New Mexico. Lastly, it says that Martial Law was declared in England. To cap it all off, the main website had a trailer of an ant followed by darkness and a sound that seemed like some sort of creature. Theories were formed throughout the whole week leading up to the VGA’s. Some said a zombie apocalypse while others said it was some disease that ravaged the world’s population. There were only two things about this game that were known; it’s going to be a Play Station 3 exclusive and the developer was one of Sony’s first party developers. Finally, the trailer was revealed during the VGA’s and all I have to say is, Damn. Maybe I’ve become a Sony fan boy since getting a PS3 a few years back, but I don’t see how any other console can match the exclusives that Sony is producing right now. Maybe it’s because of the type of gamer I’ve evolved into. I’ve become a single player kind of guy; and this is where the Playstation thrives. However, I digress so I will get back to the main point. 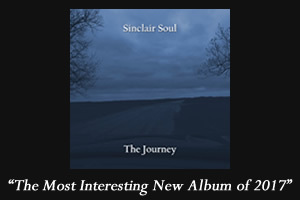 The trailer starts with the first screenshot of the leaves; sounds of wind and emptiness fill the void. The camera then pans left to show that there is a building that is slowly being taken over by nature. As the camera slowly pans throughout the building, the place looks like it’s been through hell; shelves are on the floor, shattered glass, blood on a bed, all finished off with a body that’s dripping blood. We then see the game’s first character, a girl named Ellie, running because she hears a commotion in the floor above her. She reaches her destination, and sees two men fighting over something. I was left to assume that one of them was a human while the other was a zombie. One of them eventually wins and, surprisingly, we see that they are both human. We then hear the girl talk asking if the man was okay, and we find out that the two of them are working together; the man’s name is Joel. The girl searches the dead man for supplies and expresses relief when she finds ammo in the man’s chest pocket. The two hear a noise coming from another room and quickly hide somewhere. Again, I assume that the creature is a zombie of some sort, but when Joel finally comes out from cover to kill it, it looks like something completely different. From the way I see it, I think that the creatures aren’t zombies but instead a result of whatever infection demolished the world. After this, we see the two characters running to get out of the building. 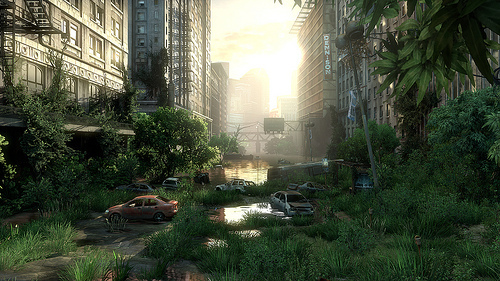 From here, we see the extent to which nature has taken over; and it’s bad. The city has been completely taken over; vines are growing everywhere while cars sit abandoned on the road. 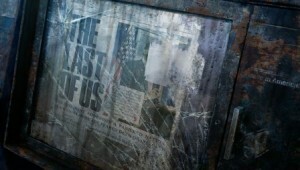 Here the trailer ends, and we find out the developer is none other than Naughty Dog; the studio behind the critically acclaimed Uncharted series. 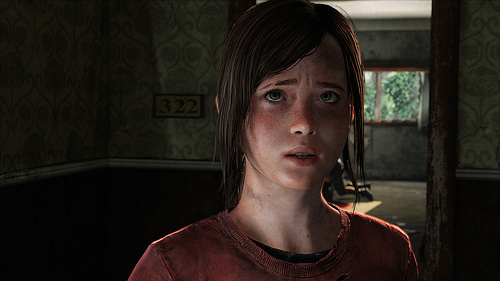 This is everything that we know about The Last of Us for now. There’s bound to be more information as the months go by, with a late 2012 release date maybe. If Naughty Dog put as much detail into this title as they did Uncharted, then we are in one for one hell of a surprise.